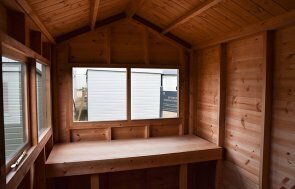 This 1.2 x 1.8m Superior Shed is the smallest standard size shed we make, and it has been installed in our customer’s small garden in Salisbury, Wiltshire to be a small, yet attractive storage shed. Heavy duty felt has been used to cover the roof for practical, durable protection that will last for 12-15 years, and the roof overhang adds a little extra style to the building (as well as offering protection to the door below it. A Georgian window has been placed in the single door, along with another on the left-hand side to add a bit of traditional elegance to the shed, and the whole thing has been painted in a natural green colour, called Lizard, from our Valtti paint range. All of our buildings are made from FSC® certified Scandinavian Redwood, which is a slow-grown timber (over the course of around 100 years) to help reduce the number of dead knots, and increase the timber’s longevity. If you like the look of the paint used on this shed, there are 15 paint colours to choose from in the Valtti paint range in total, and you can have samples sent to you if you’re unsure on which to choose. 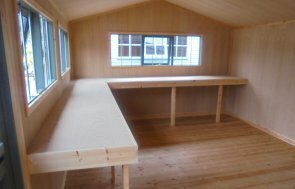 Also available with our Superior Sheds is the Sikkens Paint System, as well as the Farrow & Ball paint system. For more information on the options you can choose from with our Superior Sheds, please call us on 01760 444229 or send us an online enquiry to ask us any questions you have.